Ron published a Feis Ile 2009 programme overview and promises to publish daily like the one for Saturday and Sunday. So far the weather has been fairly dull (which is quite unlike previous years), although it seems to brighten up now. The Edinburgh Whisky Blog organised an Islay whisky coaching night in preparation for the festival, only to have to cancel their attendance at the last minute. Sorry to hear that! 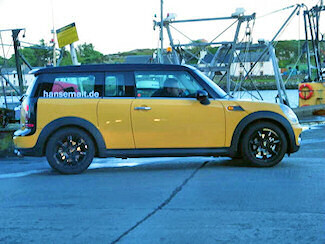 Others are luckier, the yellow Mini Clubman from Germany I mentioned in the ‘Another Islaymobile?’ entry has been spotted on Islay since leaving the ferry on Saturday morning. Thanks to the wonders of modern technology we know that they have arrived at their cottage and enjoy the views (and a wee dram). They also tell us where to spot the yellow Mini Clubman on Tuesday (Laphroaig to be precise). Say hi to them if you spot them. The Outsider Dram is Bruichladdich's offering for the festival, they also blog about the Homecoming 2009 Valinch. Joan continues his Islay distillery series with Malt whisky: Destilleries: Caol Ila. I've already mentioned them but then again its a blog and it fits, so if you understand Czech and want to learn about the whisky making process using the Islay distilleries to illustrate, then head over to Ze ivota whisky v obrazech – díl I. and Ze ivota whisky v obrazech – díl II..
Not to the festival as such, but Dubber & Clutch are visiting Jura for some whisky tasting. The had a rather exciting crossing to Jura before going to dinner and tasting the Jura Elements. Later they went to a ceilidh, And that’s what it’s all about. The Scotch Hobbyist tastes the Port Askaig 17: International Dram of Mystery. Dr Whisky on his Malt Mission 2009 #352 tastes a Bunnahabhain. And the guys at caskstrength.net ask Is this, or is this ain't an Islay? They are also on their way to the Islay Festival. I think that's enough whisky and festival for now. Let's continue with some other Islay visits: The distracted muse writes about Islay (and stuff), there are a few more Islay pictures in her Scotland set. Michael and Jacqueline enjoy their first day on Islay. I have no idea what they are saying, but the Finnish blog bulbbi has a post titled ‘Islay’. OK, on to birdwatching. Usually I start with the Islay birders, but let me start with the visiting birders today. Not entirely sure if he's still on Islay, but James Wolstencroft spotted a variety of birds on Islay recently, including Corncrakes, Whimbrels and Housemartins and 2 Hobbys. On the Islay Birds blog we find a picture of an Arctic Tern and quite possible a second pair of Shelducks. The numbers are still outstanding, but Ian and many others participated in the first Corncrake count for the year. John Islay Birder Armitage also participated in the Corncrake count in addition to other outings. In other news: It is Mark Unsworth's 50th birthday today. Elliott has news of the M.V Spirit Of Adventure and the M.V Prince Albert II visiting Port Ellen, now with pictures. Last but by no means least the Islay photoblogs: Mirko Herzner has a picture of a bus shelter the Islay Airport terminal and airport runway. On the birthday boys Islay Photography Gallery I particularly liked the Mist on the Moss and the Port Charlotte Sunset from a boat. On Ron's picture blog we find Islay Festival Bruichladdich Open Day 2008 and Lagavulin Open Day Islay Festival 2008. Of my own pictures on the Islay Pictures photoblog my personal favourites are the Green Rocks at Saligo Bay and The Paps of Jura from Bowmore, Isle of Islay. More Islay blogging and roundup next week. I suspect with quite a lot of Feis Ile again.